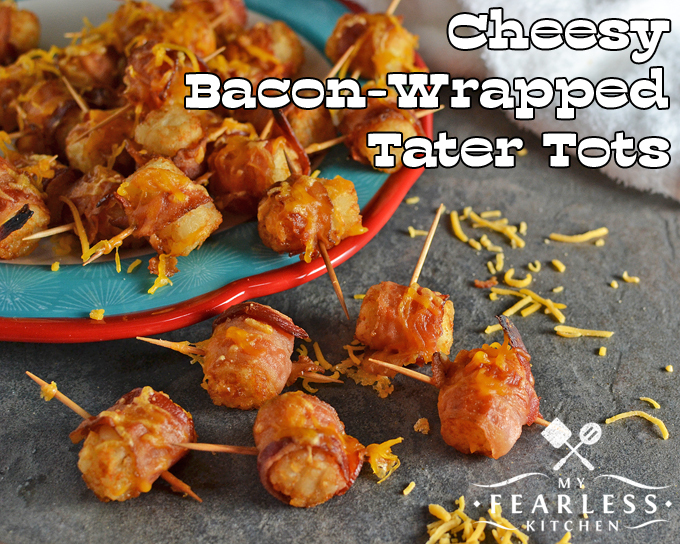 Try these Cheesy Bacon-Wrapped Tater Tots for your next tailgate party or after school snack. They’re easy to make, and sure to please everyone! 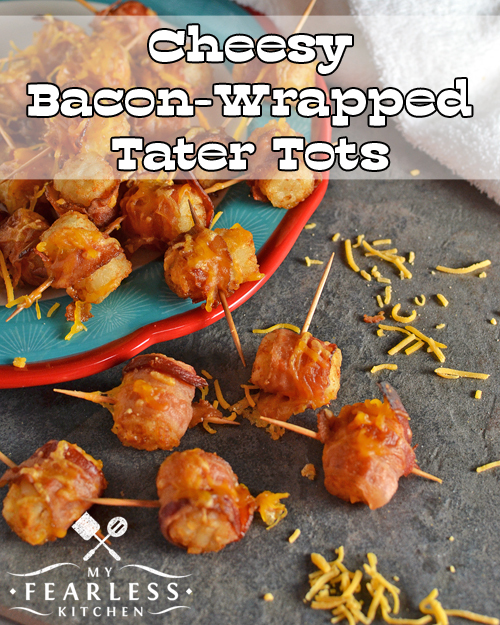 These Cheesy Bacon-Wrapped Tater Tots are my new favorite things. I really wish they weren’t (especially since my doctor just told me I really need to lose some weight). But, oh my goodness… they are so good! I was worried about 2 things in this recipe – the type of bacon I used, and if the tots would get crispy in the oven. I used pre-cooked bacon for these tater tots. I have never tried this kind of bacon before. 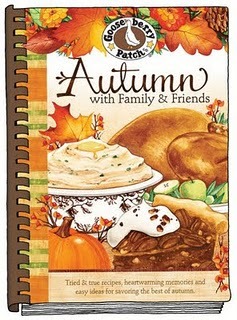 It was all about convenience and speed of getting these on the table for dinner. I usually buy bacon in a big 10-pound box from our local butcher, so this was a big deal for me! (Yes, we go through that much bacon. And yes, that’s a big part of why I need to lose weight.) I was really pleased with how the pre-cooked bacon worked, and how it tasted. The nice thing about the pre-cooked bacon (other than it already being cooked, of course), is that it wasn’t as greasy as raw bacon. Some of the grease had already been cooked out, so you don’t need to worry about the tots sitting in bacon grease, or draining the extra grease off. There was just enough grease left in the bacon to help the tater tots get super-crispy while they baked. So good! Last tip – it’s really hard to stick a toothpick through a frozen tater tot. Let them thaw for 10-15 minutes at room temperature. You don’t want them all the way thawed, just enough so you can get a toothpick through the center. If you have leftovers, put them in a Ziploc freezer bag and stick them back in the freezer for next time. Can I Refreeze Food After It Was Thawed? 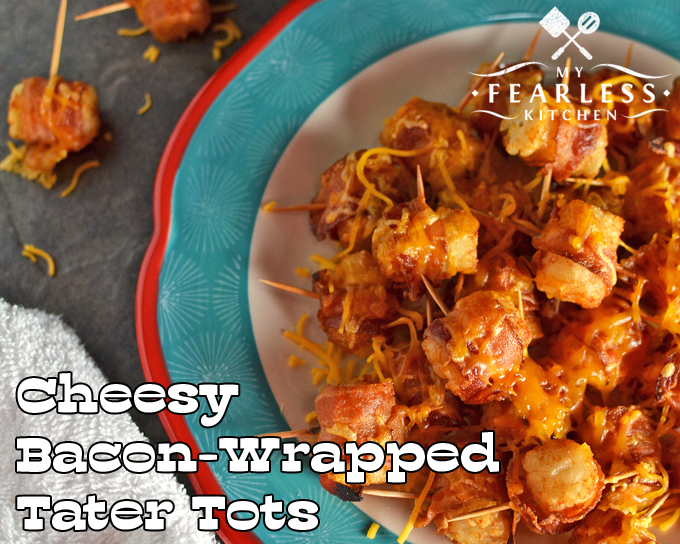 Try these Cheesy Bacon-Wrapped Tater Tots for your next tailgate party or after school snack. They're easy to make, and sure to please everyone! Cut bacon in half (so you get two shorter pieces from each piece). Wrap one piece of bacon around each tater tot (it should just reach). Secure with wooden toothpicks. Lay wrapped tater tots on a lipped baking sheet in a single layer. Bake at 425 degrees for 10-15 minutes, until tots are done. Handle carefully; place tots on a serving plate and sprinkle with cheese while still hot.